There are many Food Thinking Solutions, to our most common Food Thinking Mistakes, that will help us correct our thinking mistakes, and help us learn to create Healthy Diet Habits. What kind of thinking error could I be making? What evidence is there, that this thought might not be true, or completely true. Is there an alternative explanation, or another way of viewing this? What is the most realistic outcome of this situation? What is the effect of my believing this thought, and what could be the effect of changing my thinking? What would I tell a close friend, or family member, if he/she were in this situation and had this thought? Thinking Mistake #9: Exaggerated Thinking. I control myself most of the time when I go to dinner parties, so this thought is probably not based on truth. I am not sure that I actually want to control myself tonight, because I have been craving some sweets today, and I know my friend will bake something great. I will control myself. If my friend makes a great dessert, I can have a small piece, because I have eaten very healthy today. I believe that I will be successful, because I am going into the situation with a plan. I now have a positive attitude, and I will be a success. I would try to tell a friend, that she would be able to control herself, because she always controls herself when I see her in eating situations, and she would feel badly about herself if she did not control herself. Eating is not worth feeling bad about yourself. I think that I will eat a small healthy snack before I go to my friend’s house, because we are eating later than I normally eat, and I do not want to be starving. I never lose control of my eating, when I am not starving. To change your food thinking, might mean that you take a few minutes and actually answer these questions by writing them down. If you were in Cognitive Behavior Therapy, you would be writing them down. As you practice this, you will learn to automatically change your thinking, rather than asking the seven questions. 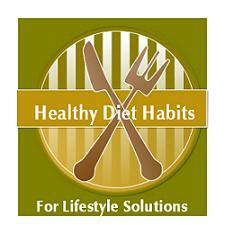 This will be a lifestyle solution that will change your entire life, and not just with eating. I have an autistic son, who has been in Cognitive Behavior Therapy for 3 years. He learns his social skills through this therapy, doing exercises very similar to this one. It is absolutely amazing, and I am 100% sold. Our thoughts do get us into trouble, but it is possible to change our thinking and our behaviors! This is a healthy diet habit that is worth putting the time into, even though it might feel a bit awkward when you first start! You can purchase "The Beck Diet Solution", by Judith S. Beck below, directly from Amazon.com. It is one of my Top 10 Recommended Books to read along with her six week workbook, and has wonderful information about food thinking mistakes, and food thinking solutions!